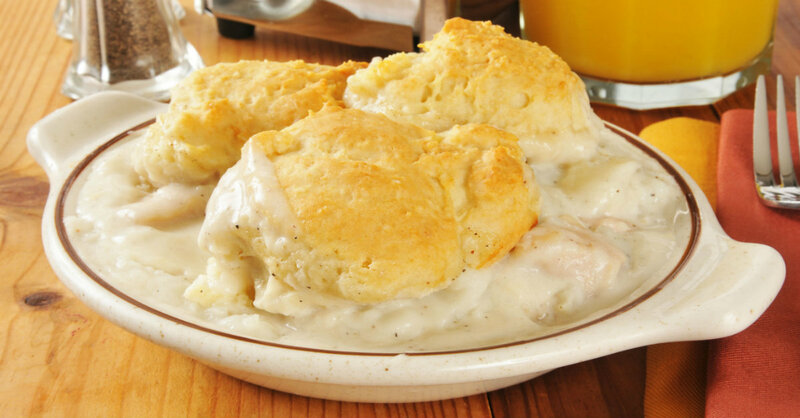 It’s Not A Soup And It’s Not A Casserole…This Biscuit-Topped Stew Is The Best!! You know how much we love casseroles around here, but we also love a good, hearty soup…it only seemed natural to combine the two and form a thick stew with freshly baked biscuits on top to really round things off. We love biting into the tender chicken and potatoes, plus, the surprising, juicy pop of the pearl onions offers the perfect contrast – variety is the spice of life, after all! If you’ve ever wanted something rich and satisfying and totally perfect, this is the meal for you! Preheat oven to 375º F and line a baking sheet with parchment paper or aluminum foil. Place potatoes in a large pot of cold, salted water. Bring up to a boil and cook for 15-20 minutes, or until fork tender. Rub chicken all over with olive oil and season generously with salt and pepper. Place on a baking sheet and roast for 35-40 minutes, or until cooked through. Remove chicken from oven and let cool before removing from bone and rough-chopping. In a large sauce pot or Dutch oven, heat butter over medium heat until melted, then add pearl onions and sauté for 8-10 minutes, or until softened and just lightly browned. Sprinkle flour over the butter and onions and stir so that a smooth paste forms. Cook roux for 2 minutes, then slowly mix in chicken stock, garlic powder, rosemary, salt and pepper, and cook for another 2 minutes. Pour in heavy cream, then stir in cooled potatoes and diced chicken. Transfer mixture to a large baking dish and place on lined baking sheet. Place baking sheet in oven and bake for 15 minutes. Prepare biscuits by cutting butter into biscuit mix until mixture resembles small pebbles. Stir in sour cream and mix until a smooth dough forms. Roll dough out on a clean, flat surface to 1/4-inch thickness and use a cookie cutter to cut out 6-10 biscuits. Remove baking sheet from oven and arrange biscuits on top of stew. Return to oven and cook for another 12-15 minutes, or until biscuits are golden brown.